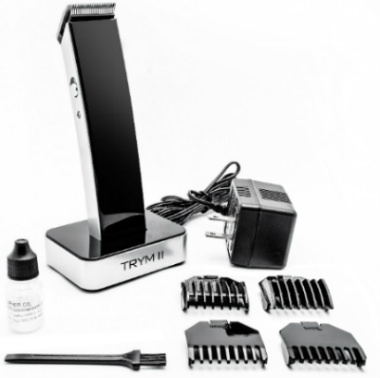 If you’re seeking a different type of men’s hair trimmer and clipper, the TRYM II may catch your eye. This manufacturer has a unique concept. 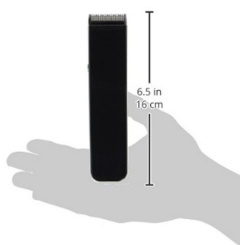 This trimmer is designed in a long black and light metallic gray rectangular casing that gently slopes inward, making it easier to hold in the hand. The on/off switch isn’t on the front like most trimmers, it’s to the side. Most men tuck their beard trimmers or clippers into the drawer of a bathroom. You won’t have to do that any longer. 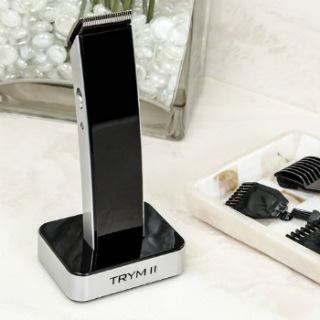 You’ll be proud to display the TRYM II on your bathroom counter. Your partner won’t even object. At first glance it’s hard to tell what it is. 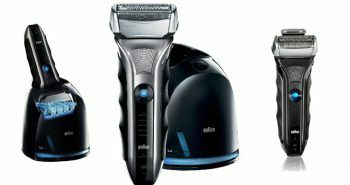 The Pure Enrichment company paid attention to every detail of this new style of men’s trimmer, including its sleek design and modern presentation. This design will enhance the look of your bathroom. This trimmer also has the advantage of being cordless and rechargeable. It was designed with a minimalist and modern design. Its ultra-sleek appearance will look great in any bathroom. It was designed with the clean sleek designs of Apple in mind, but does not have any affiliation with this company. It was designed by the Pure Enrichment company. The Pure Enrichment company makes a line of personal care and household products to balance and enhance your life. These products focus on bathroom, relaxation, and purification systems. Each has been meticulously crafted to meet high quality and standards, and each has a good warranty. This hair trimmer works perfectly on trimming head hair, mustache, beard, and body hair. This model is built with a strong battery and sharper blades than previous models. Built within the trimmer are professional-grade blades and parts that will enable better cutting and trimming of any thickness of hair. Each of the compound metal blades has been designed and crafted for excellent high-quality cutting and trimming. It provides an effortless solution for trimming all of your body hair. 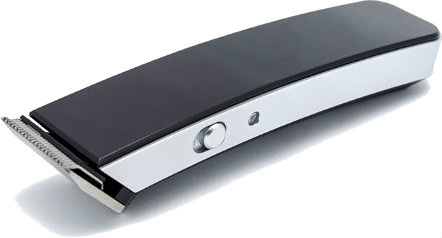 The blades of this trimmer were designed to remain sharp, and last a long time, without becoming dull. 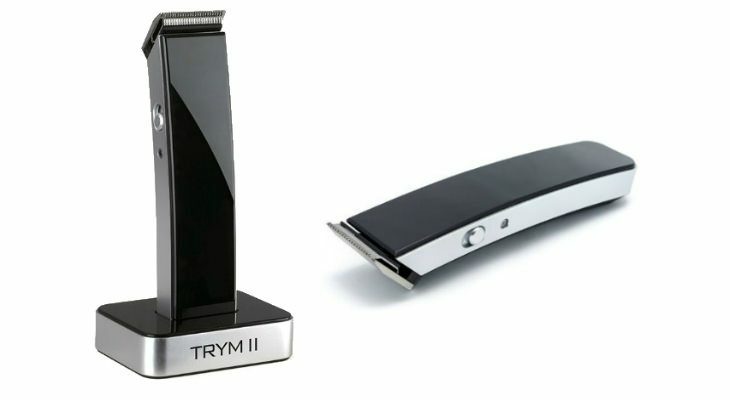 Besides providing an effective shave, the TRYM II clipper and trimmer will provide a safer shave. Men will find that this trimmer will never snag or pull at your hair. You’ll have a good shave, and your skin will be left as comfortable as it was prior to shaving. You won’t have any worries about razor burn, or red, itchy, sore skin. You can select from four different lengths of trimming combs which can be used to trim facial hair, sideburns, mustache, goatee, head hair, body hair, and stubble. There is the 1.8mm, 3mm, 6mm, and 9mm in length. These combs enable you to create a rugged stubble look on your face, or you can just give your head a short little trim. Either way, you can select the optimum length for your purpose. 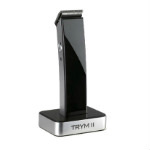 To charge up your TRYM II trimmer you place it on the square black charging base, which has an attachable AC adaptor. It runs on 110 volt North American power, with a UL listed power supply. This trimmer comes with an assortment of tools. Inside each package you’ll receive the following. There are four different sized combs, machine oil, a cleaning brush, a stand, and a charger cord. All of this ships inside a retail-packed gift box. The trimmer is only 6.5 inches tall. It weighs less than one pound, and about 1.2 pounds in the box with all the accessories. The TRYM II comes with a one year warranty which is several months longer than most. 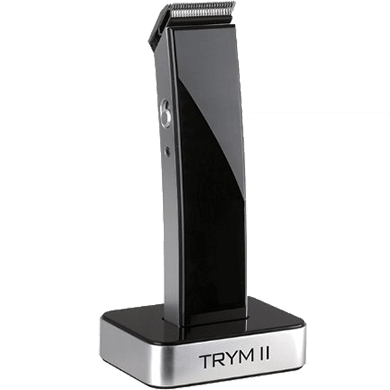 The TRYM II costs only $30, so you’ll be able to afford this as an additional purchase to a men’s shaver. 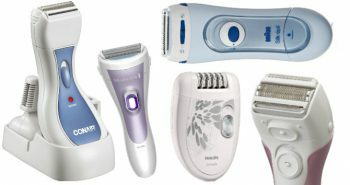 Its also makes a great men’s gift, as many men often try to make do with their current men’s shaver, or even scissors. Most men will appreciate this thoughtful gift which provides a solution to their grooming issues. If you’re seeking a gift, or need to buy a reliable men’s hair trimmer/clippers in one, take a look at the TRYM II. While it can only be used for dry shaving and not wet, it will ease the burden of the chore of always looking your best.